I am pleased to be holding today’s stop for the Chapter One Events Blog Tour! As some of you may know, Chapter One Events is a nonprofit organization based in Chicago, Illinois, whose goal is to provide resources and a supportive community for young writers all around the world. 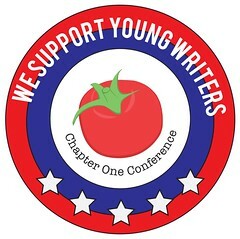 We have two annual conferences: Chapter One Young Writers Conference for writers between the ages of 11 and 20, and Chapter 21 Writers Conference for writers between the ages of 21 and 29. This years’ conferences will be held Saturday, August 4, 2018. You can find all additional information, including this years’ conference schedule and list of speakers on the Chapter One Events website! Okay, now that the official spiel is out of the way, I am here today to talk with you about something that I don’t think is talked about enough: mental health and young writers. Chapter One Events has broached this subject in the past, but I wanted to re-introduce this important topic and hopefully start a larger conversation. I have dealt with anxiety and clinical depression for a long time. While I was only officially diagnosed two years ago, I spent a lot of my time as a young writer doubting myself and my talents, and this seriously crippled my ability to write and be creative. I wrote and edited my first novel in high school, after which I couldn’t seem to find the motivation to write again because I felt as if I had reached my peak; that, somehow, my 17-year-old self had managed to create the only “real” piece of writing I would be able to produce in my lifetime. This, I know now, was total nonsense, but my depression made it very difficult to see a future for myself as a writer, and as a result, I stopped writing for years. This was a huge problem for me because, as all writers know, writers HAVE to write. There really is no other option. For years I felt terrible because I wasn’t writing, which resulted in me questioning my ability to write, which led to a lack motivation to write, and it all became one terrible cycle. Thankfully, I found my writer’s voice again and I’m slowly working my way back up to full writing health. However, it was not an easy road to return to my writing roots, so I wanted to share my story in hopes that it will help the process be easier for the next person. According to a 2010 survey conducted by the website Health.com, the writing profession is among the top ten professions at greatest risk for depression. The website gives two major factors for this: a lack of stable income and general isolation. In my experience, both are very true. Writers tend to spend a lot of time keeping company with only themselves (unless you count all of those characters rattling around in a writer’s brain, though most people do not). And, let’s face it, unless a writer makes it big – like, REALLY BIG – he or she is not going to be making boatloads of money as a writer. Those are just the facts. There are also moments in the creative process that can make writers additionally vulnerable to moments of severe depression and anxiety. This isn’t to say that every writer will experience depression and/or anxiety – absolutely not, all people are different – but because of the nature of writing (much like with other creative acts such as painting), writers are more susceptible to these feelings. Creating art, whether that’s on canvas or on paper, requires the artist to bare a piece of his or her soul. As corny or cliche as this may sound, it’s the truth. For every word you write down on a page, you give a little bit of yourself to the reader. In the same way that musicians utilize their own experiences to write music, writers create fictional people and worlds that are deeply rooted in themselves. Because of this, it can be incredibly challenging to share your writing with others, and the fear of rejection – or the rejection itself – can be crippling to an author. Writers as a whole have a long history of substance abuse. Again, this is often related closely to strong feelings of isolation and depression. Some of the most famous writers with histories of substance abuse are also household names: F. Scott Fitzgerald, Ernest Hemingway, Robert Louis Stevenson, Tennessee Williams, Stephen King, Dorothy Parker – unfortunately, the list goes on and on. Many psychologists theorize that there is a direct correlation between the “creative genius” and depression due to the fact that people, like authors, who are innately creative spend so much time thinking about their own anxieties and fears (spend so much time deep in their own thoughts) that they use substances like drugs and alcohol to pull themselves out; to avoid feelings like depression and anxiety. In opposition, some argue that writers abuse substances in order to delve even deeper into their own minds – to reach a place of creativity that cannot be accessed without an additional “boost.” Whatever the cause, many scientists are in agreement: creative minds, writers included, are at a higher risk for substance abuse than other fields of occupation. What Can Be Done to Combat Anxiety & Depression? Unfortunately, anxiety and depression can make you feel incredibly alienated from everyone in your life, including your writer peers. There are ways to combat these feelings, but first, you have to take the most important step: have initiative. You must be willing to do something about your problem. After all, feeling better has to start somewhere. This is it! Talk to Someone. While it can be difficult to talk with someone about how you’re feeling, it’s an essential step in order for you to start getting better. Talk to your doctor, a parent, a teacher, a friend, and let them know what’s going on. I absolutely hated this step, it made me feel like I was weak because I couldn’t even control my own brain. As it turns out, this is a common thing to feel. Tons of people who suffer from depression and anxiety feel this exact same way. Depression does not reflect upon your abilities as a person in any way, it’s merely a sickness that needs to be treated. Talking to someone is the start of this treatment. Get help. If you’re feeling overwhelmed or like you’re about to make a rash decision, there are tons of people you can talk to. YOU ARE NOT ALONE. You are not in this by yourself. There are a lot of people out there who want to help you. Take a look at the resources listed below. This Way Up – Learn more about anxiety, depression, their symptoms, causes, and ways to feel better. Turn to Me – One-on-One professional counseling. International Hotlines – Find phone numbers for emergency hotlines in countries around the world.